Enspyre's President talks about why he thinks students should attend the Enspyre Internship. Valerie talks about her experience with the Enspyre Internship. 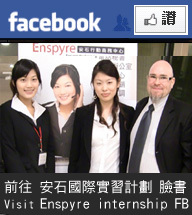 Since February 2009 Enspyre has been growing its internship program. Based on our President and Co-founder Elias Ek's belief that school alone is not enough, we are offering our internship opportunity to all students. By joining Enspyre as an intern you will learn about internet marketing, website management, the Taiwanese business environment and much more. 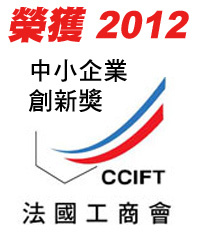 You also have a chance to build business relations in Taiwan that can be useful in the future. Is managing a website a job for a programmer or a marketing person? Do you need a lot of programming skills? Have you ever wondered how Google and Yahoo ranks websites? Why does a website end up number one and another never show up at all? You will learn the most important concepts of "Search Engine Optimization". Have you ever clicked on an ad in Google, Yahoo or Facebook? Do you know how they charge? As an Enspyre Intern you will learn how to manage an online advertising campaign and write ads that makes people want to click on it. This website lists many of the accountants in Taipei and is a resource to help Taiwanese companies to find someone to help with tax filings etc. Yes, the very website you are looking at now, was built and managed by interns or former interns (who are now working for Enspyre). At the time of this writing, this website is ranked number one in Taiwanese Yahoo for the Chinese word for Internship - 實習. Check out if we are still number one by clicking on this link to Yahoo: http://tw.search.yahoo.com/search?p=%E5%AF%A6%E7%BF%92&fr=yfp&ei=utf-8&v=0. Typically, an internship period will last for 3-4 months. During this time you will first learn basic skills and then be assigned specific tasks that you are responsible for either by yourself or in a team of interns. Enspyre was founded in 2002 by Swedish national Elias Ek and Taiwanese Jane Wei. The original services were Phone Answering and Virtual Office services. Enspyre is still Taiwan's premier business for these business services, but has since added many more services. The biggest now is Business-To-Business (B2B) Telemarketing but there are also Internet Marketing services, Swedish Language Classes,corporate training etc. Elias Ek joined Enspyre as President in December 2002. Mr. Ek most recently served as Director of International Marketing for Tablet PC maker PaceBlade, where he built the foundation for a worldwide brand. Before joining PaceBlade, Mr. Ek worked with marketing for B2B marketplace AsianProducts.com, and prior to that as Marketing Manager for TRICOR, the business arm of the State of Tennessee. Mr. Ek received a Bachelor in Business Administration in Marketing and a Bachelor of Science in Radio/TV Broadcasting from Austin Peay State University, Clarksville, Tennessee. Mr. Ek is from Sweden, but has lived in the US, Japan and Taiwan since 1994. Having lived in 4 countries and always being a keen observer, Elias likes to compare countries and cultures. "There is good and bad with every place" he likes to say. Some favorite questions are: why are Taiwanese buildings so badly insulated, why Taiwanese waiters generally do not remember who around the table ordered what (waiters in the US always do, how? Operating system? A note book perhaps?) and what exactly IS the ROI on keeping Taiwanese kids at school at all hours? Can one see that torturing kids with night school and extra homework really does the national culture or economy any good? Elias has tried many different professions and long had the dream to start a company. In 1992 he was bidding for one of the national licenses for commercial radio that the Swedish government were auctioning off. While in the end an 18 year-old had no chance against national and international companies, it was an educational experience. He is very happy to give back by offering students opportunities to see if marketing is their chosen field.